In 1969, young Kirin Narayan’s older brother, Rahoul, announced that he was quitting school and leaving home to seek enlightenment with a guru. From boyhood, his restless creativity had continually surprised his family, but his departure shook up everyone— especially Kirin, who adored her high-spirited, charismatic brother. 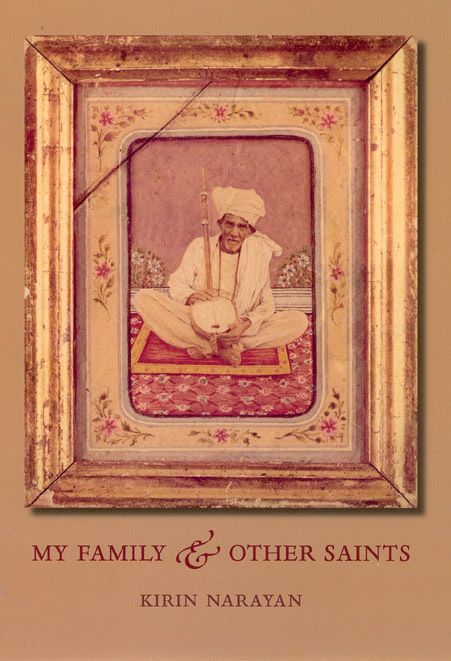 A touching, funny, and always affectionate memoir, My Family and Other Saints traces the reverberations of Rahoul’s spiritual journey through the entire family. As their beachside Bombay home becomes a crossroads for Westerners seeking Eastern enlightenment, Kirin’s sari-wearing American mother wholeheartedly embraces ashrams and gurus, adopting her son’s spiritual quest as her own. Her Indian father, however, coins the term “urug”—guru spelled backward—to mock these seekers, while young Kirin, surrounded by radiant holy men, parents drifting apart, and a motley of young, often eccentric Westerners, is left to find her own answers. Deftly recreating the turbulent emotional world of her bicultural adolescence, but overlaying it with the hard-won understanding of adulthood, Narayan presents a large, rambunctious cast of quirky characters. Throughout, she brings to life not just a family but also a time when just about everyone, it seemed, was consumed by some sort of spiritual quest. "When the 16-year-old son and brother of a liberal urban family in Bombay becomes enamored of gurus and holy men, the family responds in various ways. The sari-wearing American-born mother, who loves all things Indian, embraces her son’s quest. The Indian father does not trust anything that comes attached to religion or mysticism. Throughout, the house is continuously bursting with visiting Westerners seeking enlightenment. The memoir, written through the younger sister’s eyes, is informed by her professional anthropologist’s view: she brings the food, clothing, and colors of the unique period in the late 1960s to life. She is to be commended for her ability to re-create the era and populate it with a host of colorful characters: visitors, locals, the holy, and, of course, relatives, both American and Indian. They are supported by wonderful photos and her wry observations. A revealingly honest, humorous, and loving portrayal of unique times makes this a splendid read." "An engrossing account of a childhood spent with Indian gurus and their American disciples. Enlightenment and growing up are tossed together in the riotous and tender household presided over by Didi, Narayan, and an extended circle of family and friends. Kirin Narayan’s impressive gifts of memory, imagination, and storytelling carry us into this unexpected world of ’crazy saints;’ the journey is so much fun that it’s hard to put the book down." "Kirin Narayan brings her detailed powers of observation and nuanced description, together with her insightful and humorous appreciation of human beings as quirky individuals and products of their cultures, to present us with a few years in the history of her own family. These are extraordinary years and an extraordinary family, and this delightful and unique memoir documents much more than growing up acutely observant in a turbulent household. It also brings to life an era now almost mythical, when American and European hippies and seekers poured into India looking for many kinds of experiences. I loved this book." "Narayan has created a portrait of [her family] that is realistic in its depiction of their flaws and foibles but generous and always loving. . . . Narayan . . . finds the wonder and joy in her family’s journey and presents it to us with insight and grace."